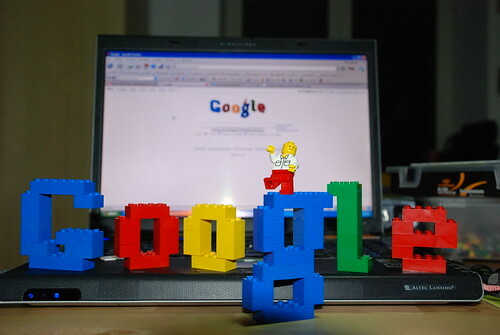 Google’s Social Search was announced this week by the Official Google Blog. 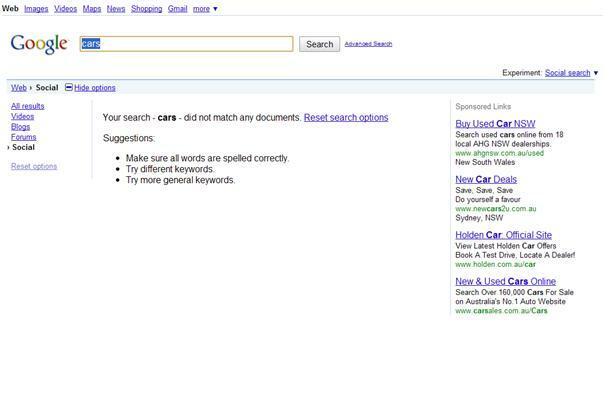 It sounds like a great tool for making search results more relevant. Social Search essentially pulls in information from social networks to augment Google’s search results. It achieves this by aggregating your social circle ( Google creates your social circle by scraping your Gmail friends, your blogs on Google reader, your Twitter followers, your Friendfeed contacts and a variety of other sources ) information and relating any input your social circle has to your search results. One thing to bear in mind is that it’s not twitter search and it’s not real-time search. I would have liked to tell you I have tested it this service and it’s great. Sadly, it doesn’t seem to be bringing up any results for anyone in the Bruce Clay Australia Office. I have tried it logged into my Google, Facebook, Twitter and with my Google reader open and links to my social media account within my Google profile implemented but unfortunately no results come up in the social search option. So either I don’t have a social circle ( according to Google ) or my social circle has no input on a wide variety of searches ( from cars to seo ) or the most likely option, that Google Social search is still a little buggy, especially with sites outside the Google.com domain. Attached is a screenshot of my social search. However this is a Google labs ‘experiment’ and I’m sure they will iron the bugs out soon. From what I have heard and read from people whose social search is active, it’s really nifty and if (make that when) this social search is added to the blended results, it will definitely add value for the searcher. There are privacy concerns with regard to Google social search, but that fear has been allayed by Matt Cutts who says any of the information returned with social search information will already be public and indexed by Google, they are just helping to assign this information to relevant search results. The results are also tailored specifically to you so nobody else will see your social circle. What does this mean for search engine optimisation? Well it means that people in the SEO industry are going to have to monitor social media much more carefully for input that could affect the search engine rankings and conversions. We might see more SEO’s getting into the social media field to get positive comments for certain results ( gaming social media accounts perhaps ). There are some immediate benefits for the average searcher. Imagine you are searching for ‘ Italian restaurant Sydney’, your results are not only ranked by relevance but also by positive or negative input your social circle has on the Italian restaurant scene in Sydney. This combined with the news that Google will be indexing and using twitter for relevancy of recent events all points to more accurate and relevant search results, which will make more searches happy and in turn make Google more revenue.